Annie loves big dogs. Great Danes, St. Bernards, dogs bigger than people. So deep is her affinity for giant canines that she has a hard time recognizing small dogs—especially Chihuahuas—as dogs at all. Now. One day in late November we were walking downtown amid the first weensy flakes of snow, and she started crowing about having predicted that the first snowfall would be on that exact date. "Yeah, but, this isn't really snow," I told her, eyeing the insignificant specks. "Certainly not the first snowfall." "What do you mean?!" she cried. "There are flakes falling from the sky! How can you say it's not snowing?" Back and forth we went, both unwilling to give any ground until finally—tempers actually flaring—I conceded that it was Chihuahua Snow. Not really significant enough to be recognized in the Snow family, but Snow nonetheless. I bring this all up because today, for the first time since I found out I had cancer, I finally cried. Well, I didn't really cry. But I did shed a few Chihuahua Tears. The ultimate irony is that after all this—the shocking news, the sudden abandonment of my life as I knew it, the diagnosis, the hospital stays, the bone marrow biopsy—it wasn't the cancer that broke me. But besides that, what was it that actually brought me down? Shook me from my perch on the good-attitude tree, and ripped the rug out from under my take-every-day-as-it-comes happy place? It's probably not going to come as that much of a surprise. Spending 8 hours over 2 days shuffling paperwork at the local Social Security Office and the Tulare County Welfare Department could do that to anybody. Long story short: have spent the last two days chasing my tail trying to prove emergency disability status to the state government, who will then grant me access to MediCal, which will then start paying for my chemo, which will enable me to get an appointment for my first treatment. The amount of paperwork and runaround it takes to achieve this access is staggering. Staggering, but not really surprising. Since when has State Government—especially as it pertains to the needs of people with little to no income—ever been friendly, accessible or prompt? Apparently not even a Stage 1V cancer diagnosis will stop them from casting me away day after day, telling me I need to return with yet another tedious document that must be unearthed to provide proof that I have no money, no income, and no property. Before I continue on with that rant—and I will be continuing—everyone should relax and know that in spite of this hot bureaucracy mess, I have actually managed to obtain an appointment for my first treatment this Friday. I can't divulge all the details here and now, because my parents have found a loophole in the system and if I want to slide through it it's probably smart not to broadcast it publicly. So, just know that I will be getting the treatment I need, and soon. It's just thanks, once again, to my overprotective parents and not the Tulare County Office of Public Works. Really, the most striking thing is power that all those bleak government offices have over the human soul. What is it about those places (and the DMV, too, though I thankfully haven't had to visit them yet) that is so extremely dis-spiriting? Why, after 10 minutes sitting in the hard aluminum chairs of the Social Security Office, do I want to scream, jump out of my skin, break a window and run for the hills? Is it the florescent lights? The ugly chairs? The terminally bored faces of the people all around you? The complete lack of any color to be seen outside the grey-scale? Are they piping some insidious chemicals through the air conditioning? It's just amazing how quickly whatever positive energy or vital life force you come in with is utterly stripped away by the very environment. Looooong before you come in to contact with a person who might be able to help you. And so it was when we returned from our miserable errands. I had no life force left. I was hungry, but everything in my belly region screams "don't put anything else in me!" The self pity welled up as I started preparing the swiss chard I have to eat every day to retain basic bowel function. I couldn't even make eye contact with Annie, because I knew she'd see the Chihuahua tears dancing in my eyes, looking for any way to fall. I finally let them loose on my pillowcase, curled up in bed. Annie called me out having cried, as I knew she would, but there was humor in her voice and it made me feel better. Then she obliged me by re-enacting the scene in Fried Green Tomatoes where Ruth is laying dying of Cancer and Idgie tells her the old story of the ducks landing in the frozen pond and flying it all the way to Georgia. It might sound morbid, but it made me laugh. 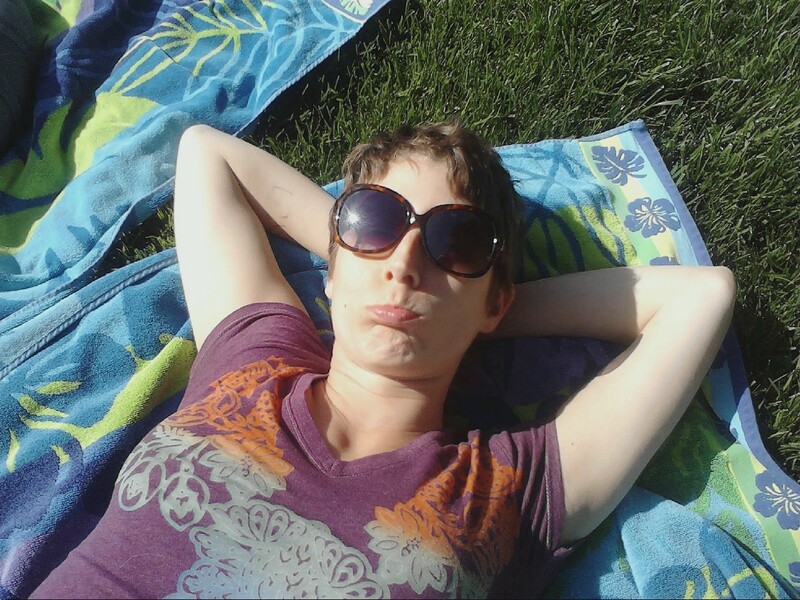 Then there was nothing left to do but take beach blankets onto the front lawn, lay down, and stare up at the sky. (See photo). You've made me cry more than once, Kia, and more than Chihuahua tears. Your words and way of sharing your story are beautiful. Thank you for sharing them. You are an inspiration and it feels good to hold you in my heart and prayers. Your story about the phone call at the coffee shop was one more reminder of how tender we all are. I don't recall who said it, I want to think it was Krishnamurti, but a concept I love despite not knowing where I heard it is that if we could truly see how hurt each human being has been—see the battles we’ve been through and survived—we would never do anything ever that could possibly hurt anyone ever again. I hope that I can always remember to have compassion for everyone just because. Just because I don’t know anything at all about what they are going through. My love and prayers are with you and Annie. I'm crying Labradoodle tears over here. (Have been since beginning to follow your beautiful posts.) The good thing about them is that they're hypoallergenic, so you won't catch anything from me. All I can say is...just take each moment as it comes. And know that there are MANY of us following your journey, thinking all positive thoughts and sending prayers. Ditto to all above, dear friend. You amaze me with your words, and your willingness to share your life so openly with so many people who care about you. Still, I feel so lucky you're allowing us to share in your experience; as terrible and scary as it is, YOU'RE an inspiration. LOVE. Wow, you nailed it ! Imagery. I'm not sure why, but your entry reminded me of dance...it had a cadence. Like in the movies where two folks are dancing cheek to cheek as focal point, the camera orbits around in dizzying circles, and the world swirls in the background. Nothing but net on your post Kia, nothing but net ! All the best tomorrow. yes, i agree. i never knew you were such a great writer. i havent been enthralled with a blog this much in my entire life. at least not since fuckyeahpizza.tumblr.com. on behalf of my public welfare worker brethren I am sorry. your opening remarks have moved me to speak; we have 2 newfoundlands (brother and sister) who actually play with chihuahuas...please come and romp with them any time. I don't know if you remember me Kia ( I am Mollys' step mom)but she linked me to your blog, which is a font of inspiration. thanks for educating us all! ps, I lived in N'hampton for 2 years (of Smith)and agree with your snow assessment.